ESO Supernova Exhibition — Could there be life beyond Earth? Earth is the only planet in the Solar System with liquid water on its surface. But Mars was warm and wet in the past, and some icy moons of the outer planets may have subsurface oceans that could support life. 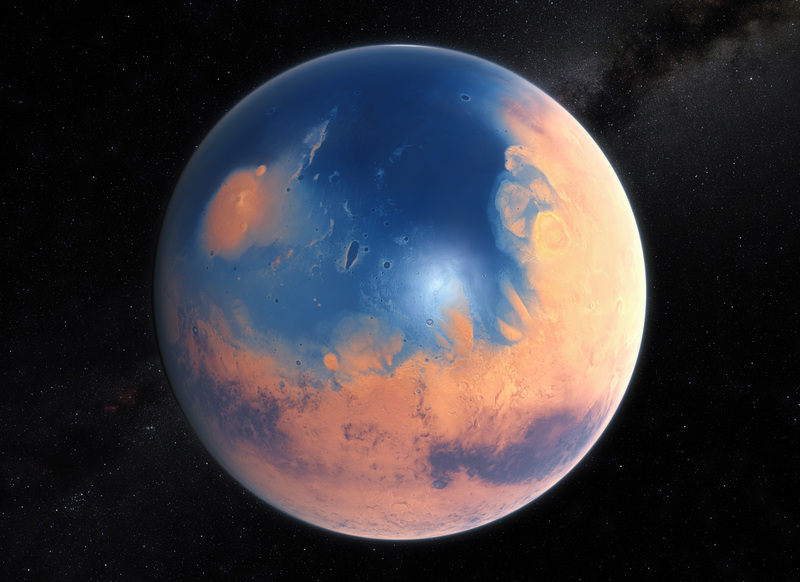 Wet Mars: In the distant past, Mars had oceans of liquid water on its surface, just like Earth - a hospitable environment for microorganisms (artist's impression). Green zone: Our Sun's habitable zone - the region where liquid surface water can exist - stretches from just outside the orbit of Venus to just beyond the orbit of Mars. As far as we know, Earth is the only living world in the Solar System. It orbits the Sun in the inner part of the habitable zone - the region where a planet can have liquid surface water. But a few billion years ago, Mars also had oceans that could have supported life. And some of the frozen moons of the giant planets, like Jupiter's moon Europa and Saturn's moon Titan, have warmer interiors and deep subsurface oceans of liquid water. Searches for past or present life - most likely in the form of microorganisms - may yield results within a few decades. Scientists think that both Saturn's giant moon Titan and Jupiter's icy moon Europa harbour gigantic subsurface oceans. Who knows what might live there? Alien seas: A future mission to Jupiter's moon Europa could drill through the ice crust and use a robotic submarine to search for life in the subsurface ocean (artist's impression). Water worlds: The subsurface oceans of Europa and Titan hold more liquid water (represented by the blue drops) than all of Earth's oceans combined. Compared to these distant planetary moons, Earth is a relatively dry world. Mercury is much too hot for life; Pluto is much too cold. But some other worlds beyond Earth may have the right conditions. And even if nothing can live on the surface, it might be possible in an underground ocean.